Fort Gilkicker was constructed as a casemated curvilinear coast defence battery for twenty-two 9 and 10-inch R.M.L. guns in the lower battery casemates with a further three 11 and two 12-inch R.M.L. guns on the roof, or upper battery. The principal fire of the fort was to be directed on Sturbridge shoal and that of the flanks was to bear upon Spithead and Stokes Bay. The upper battery had a distinct height advantage over an attacking ship and because the guns fired through embrasures without shields they had a lateral range of 90 degrees. Inside the casemated battery the gun floor was originally laid out as a continuous line of guns from west to east, with each gun casemate interconnecting with its neighbours. Because of the iron shields each gun had a restricted arc of fire that would allow very little time for individual gun captains to lay his gun on a passing ship and fire before it passed out of view. The whole point of a curvilinear design was to allow the battery to engage such a target by bringing each gun to bear in turn. As the ship passed out of the arc of fire (the plans show this to be 60 degrees for each gun) of one gun at one other gun had it in full view whilst it was just coming into the arc of fire of a third gun. As the ship passed along the Solent it would have been engaged by all of the guns of the lower battery in turn. Each gun commander would have relied upon his own skill and that of the gun layer to hit the target. As early as 1884 the Defence Committee has recognised the possible danger of a shell entering through one gun port and disabling the gun inside. 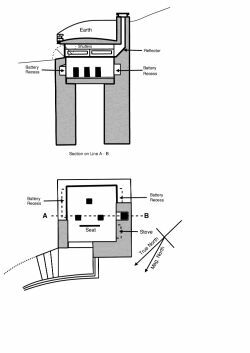 It was a distinct possibility that this could result in an explosion that would also disable the guns in adjoining casemates and a remote but possible scenario would cause the explosion to progress around the gun floor completely destroying the lower gun floor. To strengthen the superstructure and to afford greater security from projectiles bursting inside the work it was proposed to form traverses in some of the casemates by filling them with concrete. this would group the 10-inch guns in threes. At the same time the ditch was to be filled with earth to give security to the magazine. There is evidence that the same idea was put into action at other coast defence works, such as Coalhouse on the Thames. The cost of installing the traverses was £700. In 1891 the General Officer Commanding had pointed out that two of the three 11-inch RMLs on the roof were in an unsatisfactory position. 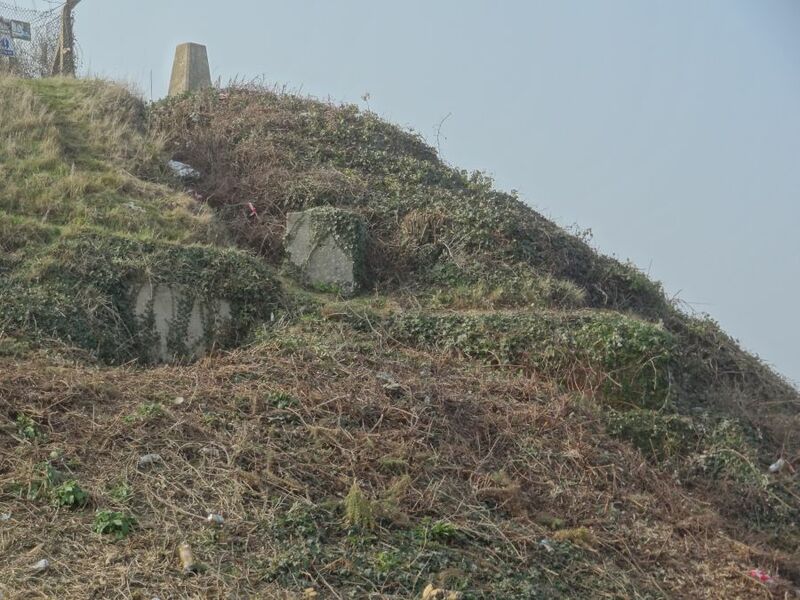 (It had been reported by the Director of Artillery as early as 1872 that eight of the guns at Gilkicker could not clear the Isle of Wight and were therefore unable to be fired) It was proposed to remove them and mount them in a new battery near Fort Monckton. 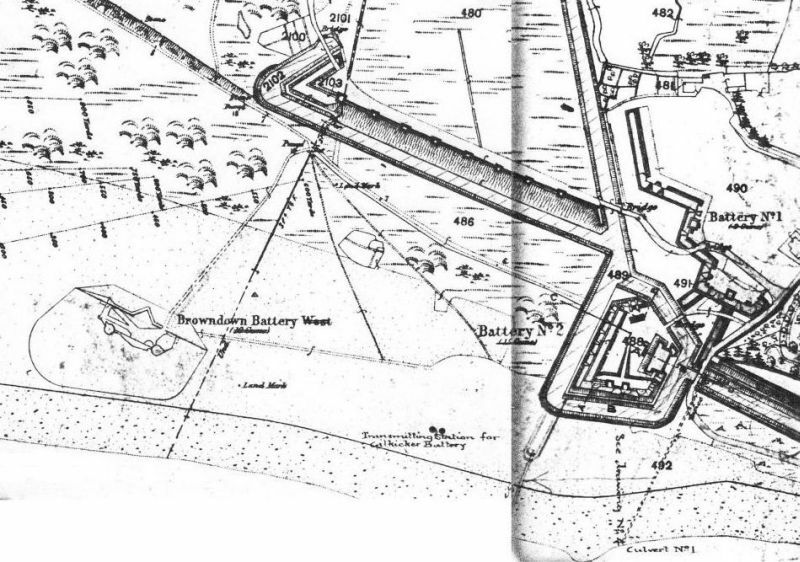 The RA and RE Works Committee however decided to remove them entirely as they were superfluous now that the armament of Puckpool battery was strengthened and Browndown battery had been constructed at the west end of Stokes Bay. In 1892 it was decided that they should be placed in Southsea Castle and this was approved. The two empty positions were filled with observation platforms for Depression Range finders. In a coast defence Battery, such as Fort Gilkicker, the guns were grouped for the purpose of control so that like natures of guns were in the same group. Each group had its own gun group commander and each had its own fire control. The main battery at Gilkicker was divided into seven gun groups, designated as A to G. The two Depression Range Finders on the roof were used to determine the targets for each gun group. Also in use for range finding were long base range finders developed by Colonel Watkin know as Horizontal Position Finders. These consisted of a transmitting and receiving cell, a known distance apart. By triangulation the rage of the target could be determined by sighting the range finders on the bow of a target. 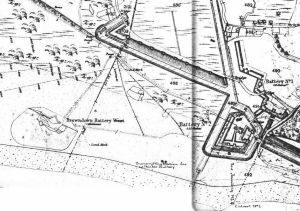 In 1897 a Range Finder transmitting station for Browndown Battery was situated to the west of Gilkicker Battery, on the beach. It consisted of two concrete cells each containing a range finder. The cells were mounded over with earth for protection and surrounded by a palisade fence. A similar pair of cells comprising the Transmitting Station for Gilkicker Battery was sited on the beach to the west of No.2 Battery. This was demolished by Gosport Council in 1929. Under the influence of Lord Sydenham Clarke, an entrenched member of the Blue Water school, and a confirmed critic of Palmerston’s Follies‘ it was considered that, for the purposes of command in action, it was desirable to mount guns in pairs of similar natures, forming a group. 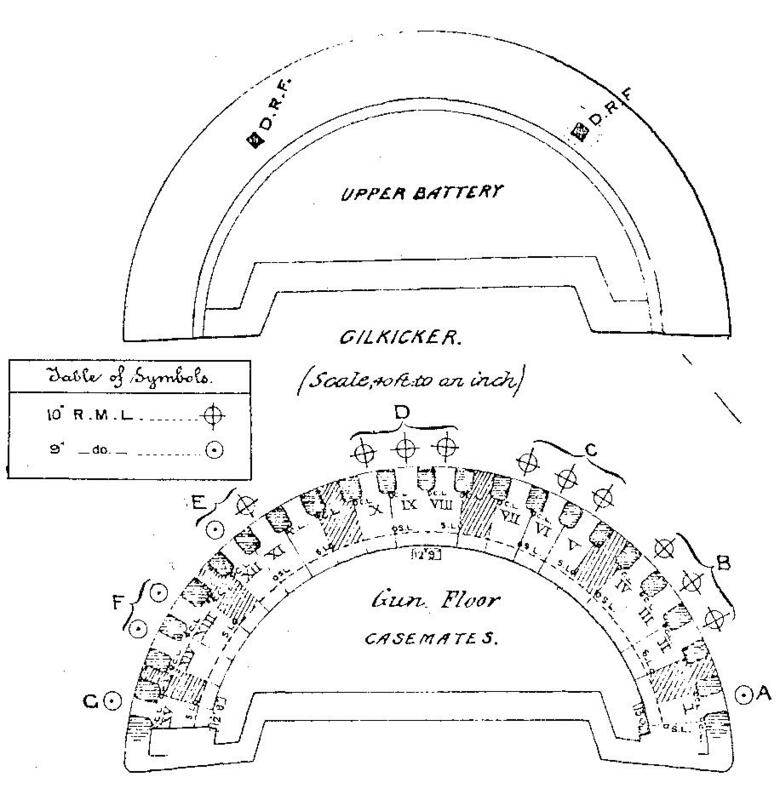 Symmetrical batteries with two heavy guns in the centre and one smaller gun on each flank were to be rigorously excluded from defence projects. In August 1894, Clarke became Superintendent of the Royal Carriage Department. He advocated the use of the 9.2-inch and 6-inch guns as the staple armament of coast defences. A reassessment of the existing coast defences was undertaken with a view to substituting the latest B.L. guns in place of the now obsolete RML guns. The Committee emphasised that fact that not only were the new BL guns more powerful than the RMLs they were to replace but it was now very costly to supply the latest type of ammunition for the existing RML guns. The authority for the work at Gilkicker was given in a War Office letter dated 21.02.1902 Portsmouth 6/1283. The work was completed on 26.10.06 at an estimated cost of £16,000 and an actual cost of £19,671. The contractor was W. Hill. The work included the rebuilding of the magazines, gun emplacements and barrack block. The magazines were altered to accommodate 1000 6-inch BL shells and cartridges and 500 9.2-inch BL shells and 1,000 cartridges. 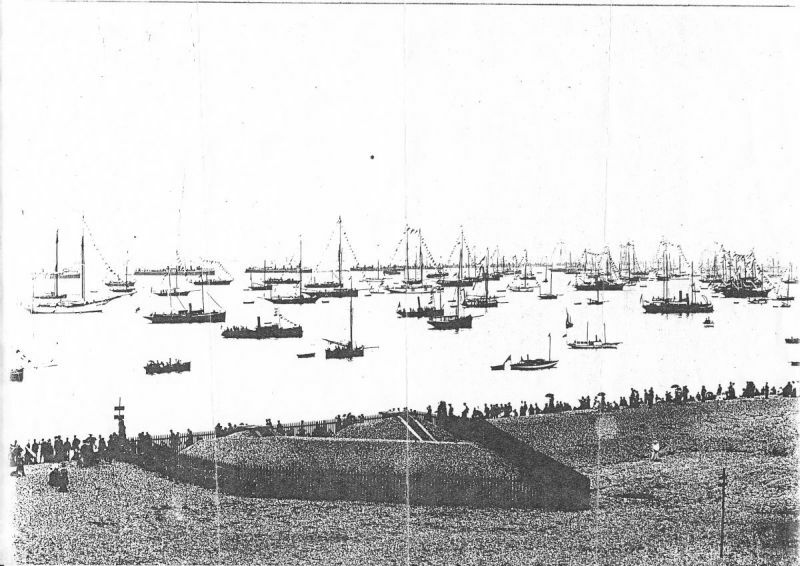 Gilkicker was to form part of the defences of Spithead where it was anticipated that any ship that had run the outer defences would have two objects in view, to bombard the dockyard and harbour from Spithead or to enter the harbour. The Upper battery was virtually demolished and a new concrete apron was laid to hide the B.L. 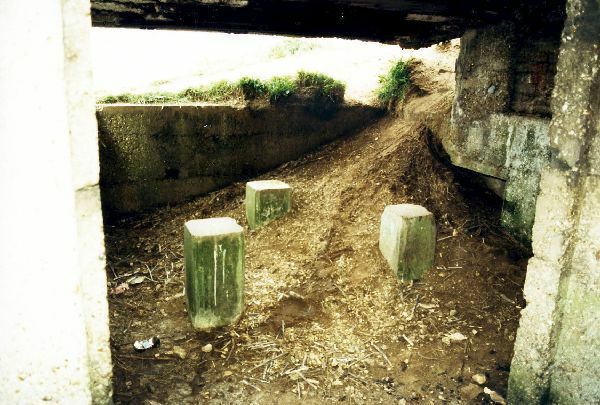 gun emplacements. The west end of the fort was modified to take the two 9.2-inch Mark X guns to prevent ships from lying at anchor in Spithead and the two 6-inch Mark VII guns were mounted at the eastern end where they could counter blocking ships entering the harbour mouth. 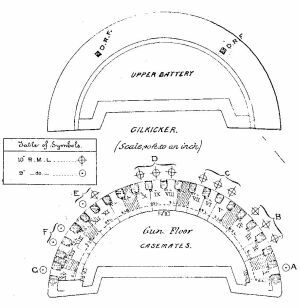 Gilkicker was to act with the new guns proposed for Browndown battery (2 x 9.2-inch B.L.) and Stokes Bay no.2 Battery (2 x 6-inch B.L.) to deter ships from lying further west within a range of 7,000 yards of the harbour. Following the usual convention of numbering guns from right to left the 9.2-inch guns were designated as 'A‘ battery, whilst the 6-inch guns were designated as 'B‘ battery. The ammunition arrangements for the 9.2-inch BLs at the fort were effected by converting two of the original magazines (nos 2 and 6) on the basement level to cartridge stores with issue hatches driven through to the old rear shell passage. 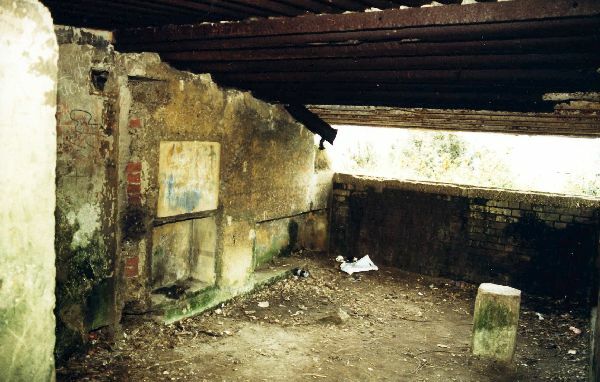 An adjacent shell store (nos 2 and 6) was modified by removing the wall partitioning it from the shell passage and adding another further back to allow the fitting of a winch and table lift. This lift ran to the upper battery were it emerged on the gun floor close to the gun emplacement. 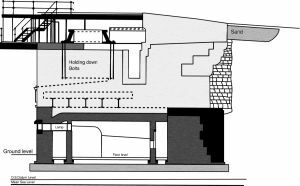 On the old lower gun floor two of the original gun emplacements were extended (casemates 3 and 11) by enclosing the veranda to the immediate rear so forming a filled shell store. The ammunition lift from the basement cartridge store ran up through the filled shell store in a brick shaft where two doors allowed the loading of filled shells, the lift serving a dual purpose. The magazine arrangements for the two 6-inch BLs was similar to that for the 9.2-inch BLs. Two basement magazines (nos. 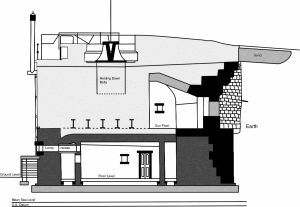 9 and 11) were converted to take 6-inch cartridges with issue hatches cut through new partition walls to the cartridge lifts which were themselves driven up through the brick arches of the original battery to the gun emplacements on the roof, no mean feat. 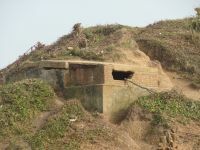 The shell stores for the 6-inch BLs were accommodated in two of the old gun casemates on the lower battery (casemates 16 and 21). In each filled shell store a shell lift was fitted. The remaining casemates on the old lower battery gun floor were converted to war shelters, ten in all, for ten men each. To assist with protecting the filled shell stores and the basement cartridge stores, and to help with camouflaging the fort, an earth embankment was piled up against the granite face of the fort. This was also continued around the rear of the fort so that the ends of the granite wall at the gorge are the only portions still visible today. It was anticipated that blockers and boomsmashers would be mercantile steamers operating at night. It was important to stop them in a short space of time and electric lights were therefore recommended as being necessary for the use of the 6-inch guns to counter this threat. Where 9.2-inch guns fired over the same illuminated waters the Committee recommended that they be manned at night and take part in this defence. Gilkicker was fitted with four fighting lights, two on each flank, with the Crossley generators fitted inside casemates 19 and 20. From there cables ran out through the gun port of casemate 20 and up through the earth bank from where they ran out to the fighting lights, which were mounted on concrete pads on the beach below. The 6-inch B.L. coast defence gun was the mainstay of Coast Defence. Built by Vickers, many of them remained in service until the abolition of Coast Artillery in 1956. With the Mark 7, as installed at Gilkicker, the Welin breech screw allowed the breech to be opened and shut in a fraction of the time needed for the three motion breech mechanism used on previous marks of gun. It could fire a 100lb shot through 15 inches of plate at 1,000 yards. 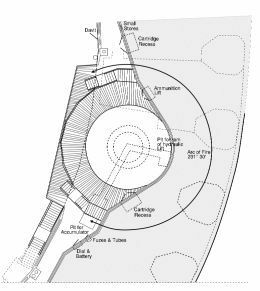 The emplacement consisted of a concrete apron with a pedestal fitted into a circular pit behind it. Cast into the rear apron of the pit were shell and cartridge recesses. 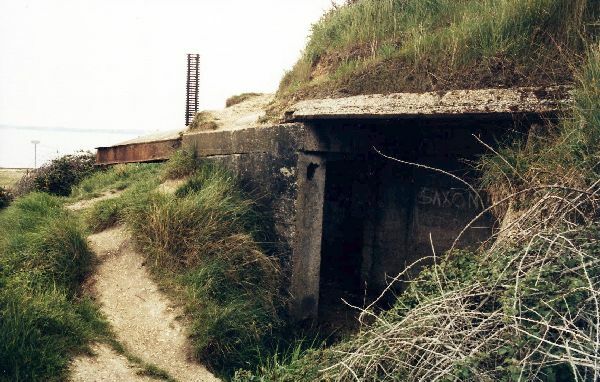 The shells emerged through a hatch in the top of the concrete emplacement at breech level whilst the cartridges came up a separate cartridge lift to one side at gun floor level. Also cast into the sides of the emplacement were recesses for the position finding dials and battery. The 9.2-inch B.L. was introduced to compete with the Krupp 24cm (9.45-inch). Various marks were introduced, first for the Navy but then adopted for Coast defence. In 1899 the gun was redesigned to improve its rate of fire and the mark 10 came into being. Placed on a high pedestal to fire over a parapet of 6ft. 6in, it was surrounded by a circular platform, or shell pit shield, at parapet level. As at Gilkicker the ammunition came up from the shell and cartridge stores below on a table lift which issued directly onto the floor of the emplacement from a recess in the concrete apron. From here the shells were barrowed around to be stored on end in a recess beneath the parapet. A hydraulic ram lifted each shell up to one of six trollies hung beneath the platform on a track. The trolley was traversed around the track to another hoist at the breech of the gun which revolved with the mounting. Here the shell was pushed through a trap in the shield onto a loading tray and was then hand rammed into the breech. The cartridges also came up from the cartridge store on the same ammunition lift, but not at the same time as the shells for safety reasons. Cartridges were stored in cartridge recesses, also built into the concrete apron of the emplacement, either side of the gun mounting. Each cartridge was carried by hand to the breech end of the gun where it was inserted into the breech by hand. The hoists for the shells were operated by a hydraulic accumulator fitted into a pit to the rear of the emplacement. This stored the energy from the force of the gun recoiling but could also be pumped up by hand by members of the gun crew. A trench containing the hydraulic pipes ran from the accumulator, underneath the gun mounting to the front hydraulic lift. A deep pit was required to take the ram when the lift was in the lowered position. The Mark X 9.2-inch B.L. fired a 380lb armour piercing shell with a 120lb cordite charge. It had a maximum range of 29,000 yards. The Mark 5 mounting weighed 129 tons with shield. The Portsmouth Fortress Defence Scheme called for Fort Gilkicker and Stokes Bay to be manned during the precautionary period by a regular battalion of infantry, consisting of 3 officers and 100 other ranks. Fort Gilkicker itself was to be manned by 3 officers and 73 men of the Northumberland Royal Garrison Artillery Militia from Berwick-Upon-Tweed. They were to travel by rail to Gosport (Fort Brockhurst Halt) and to march from there to Gilkicker. They were to be supplemented by 17 men from the District Establishment (including an Assistant Artificer, a storeman and a lampman) and 1 Sergeant Artificer from the Army Ordnance Corps with 3 officers and 22 men of the 4th. Battalion Royal Munster Fusiliers based in Killeny, in all, a total of 6 officers and 113 men. Fire control was greatly improved following the introduction of the Watkin system of range finding using Depression Range Finders (DRF) and Position Finders (PF). 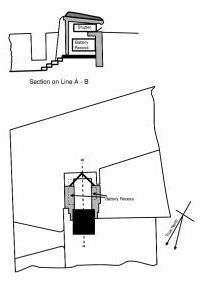 It was natural that Fort Gilkicker should receive a more up-to-date system of range finding and fire control than that in use for the old RMLs. Each gun battery was fitted with a depression range finder Mk 2D and auto sights. That for the 6-inch battery was placed on a pedestal cantilevered out from the walkway in rear of the gun emplacements. The one for the 9.2-inch battery was placed on the extreme west end of the earth embankment north of A1 emplacement. Each battery was also served by a Short Base observation Station Position Finder. The transmitting station for the 6-inch battery was sited on the West bastion of Fort Monckton whilst its receiving station was a cell built into the east end of the earth embankment. 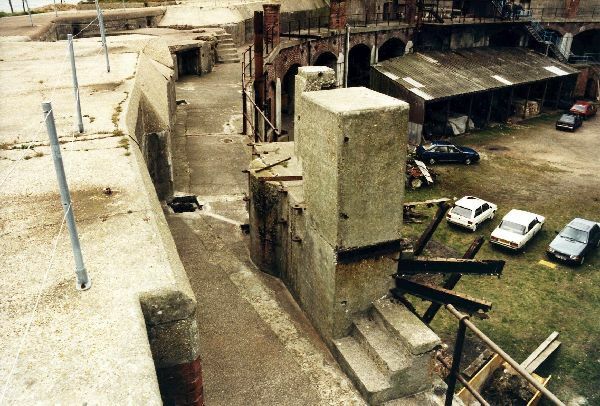 The transmitting station for the 9.2-inch battery was placed on No.4 Stokes Bay Battery to the north and west of Fort Gilkicker. The receiving station was built into the west end of the earth embankment. 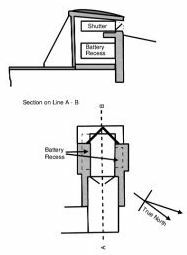 The bearing of the target was determined by the transmitting instrument and was then relayed to the receiving cell by telephone line. An Observer in the receiving cell would direct the telescope of his instrument on the bow wave of the target ship. 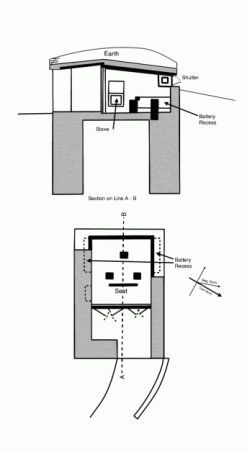 The instrument would automatically combine both readings and would then send the appropriate range and bearing to the dials on the gun emplacement. The gun would be laid accordingly and the ready‘ signal returned to the receiving cell. The observer could then fire the guns at the exact moment necessary to bring the shell and the target together. The receiving cell of the 6-inch range finder at Gilkicker is unusual in that it has a chimney with a reflector at its lower end. The top of this chimney has two slots in it, one of which may be aligned on the transmitting cell in the west bastion of Fort Monckton. The other, which is at right angles to the first, appears to allow the instrument to be aligned on one of the Spithead forts (No Mans Land) out in the sea. It is probable that this served as a means of calibrating the instrument; for this a fixed datum point was necessary. The receiving cell for the 9.2-inch guns does not have this feature. Should the DRFs and PF be out of use then the guns would be used with autosights. 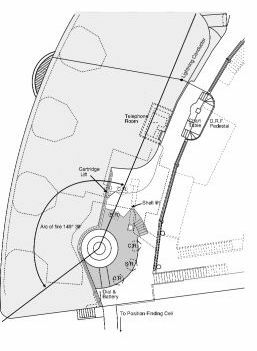 These, in simple terms, allowed the guns to be aimed directly by sighting through the telescope of the autosight, which determined the range by using the fixed height of the gun above sea level as the base of the triangle formed to the target and the angle so formed. In 1905 the Owen Committee report declared many of the Portsmouth guns to be superfluous. 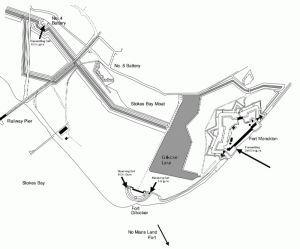 Regarding the heavy armament mounted at Portsmouth the Committee stated that the guns mounted at Gilkicker and Browndown only covered an area accessible to vessels which had forced the outer defences. To do this they would certainly have been prepared to suffer damage, which should be sufficient to deter the attempt. The Committee therefore considered these works superfluous as under the (then) modern conditions laid down for their guidance. 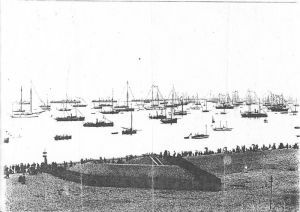 Regarding the medium armament the Committee stated that with regard to vessels entering with a view to blocking the entrance to Portsmouth harbour, they were of the opinion that they should be stopped before they reached the narrowest part of the harbour. the 6-inch guns at Fort Gilkicker were therefore considered superfluous and ineffective. The 9.2-inch and 6-inch guns were removed some time in 1906.